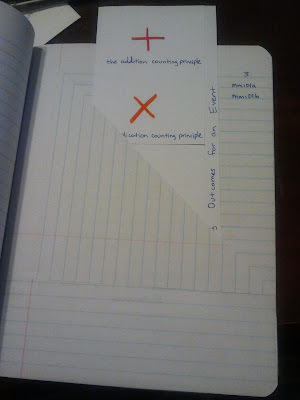 In part 1, I talked about how I set up interactive notebooks with my students. Let’s look now at how I grade this stuff. It’s 4.5 weeks into second semester, my grading period is closing soon, and kiddos need grades in the computer. Time for a notebook check! announced a notebook check and posted the list of pages I’ll be grading I came up with the list based on stuff I wanted to be certain the kids had done (key homework assignments, for example). I didn’t do it this time around, but I also like to open up to have kids nominate 1-2 pages they are proud of. checked most of the assignments as they were due — enter the date stamper This is crucial. Otherwise the grading takes forever. You can also distinguish kids who did the assignment when first assigned versus did it just in time for the notebook check (stamp vs no stamp). use a rubric. I don’t love the one my science department offered up (too bulky), so I’ve Googled around and found a few I appreciate. Have kids gluestick the rubric in the back of their notebooks so they know the expectations in advance. A note on rubrics & the pedagogy of interactive notebooks: I have something about “uses color to improve clarity of the message” in my rubric. Even if we don’t add the color during class, I like the kids to go back to their notes and add color. 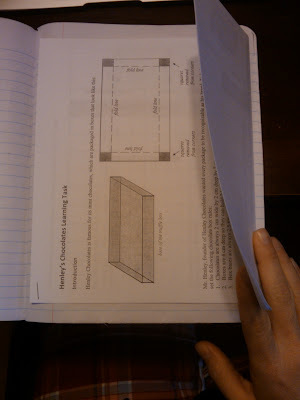 We love to fold paper, do problems in the boxes, then gluestick them into the notebooks. A composition book is just the right size to hold a page printed “2 up” on my printer. I save a ton of paper this way. 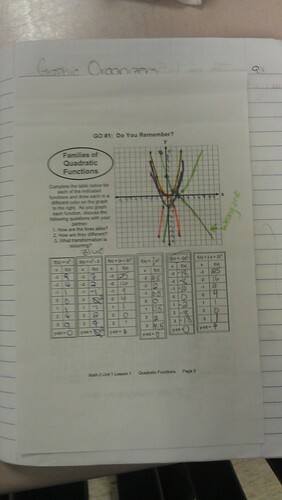 If you implement interactive notebooks, let me know what you love about them. I’m still learning but I do love the fact my kids always have paper and their other notes in class. With a semester’s worth of practice, I’m ready to share my experiences with the Interactive Notebook in math and physics. 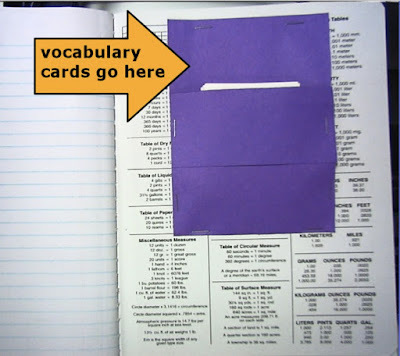 An Interactive Notebook (IN) is a bound notebook, typically a composition book or spiral notebook that a student uses for notes, practice, and reflections during a course. The interactive-notebooks Wikispace is a great place to start. I attach handouts into the IN several different ways. Here’s the easiest: se a gluestick to paste the back of the handout into the notebook, sideways. Super-duper cool tip: use the “print 2 pages on 1” option of your printer to get stuff half-size — it fits on a IN page with no folding. 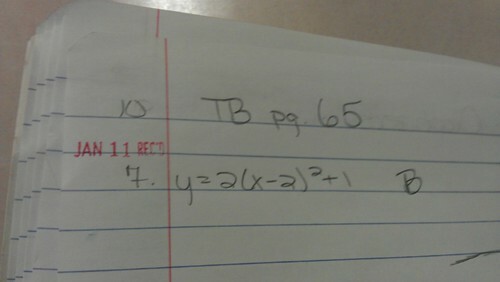 For the warmup or bellringer activity, sometimes I provide kids with the problem on a slip of paper, to be pasted in. You can get a bunch of problems on one page this way. 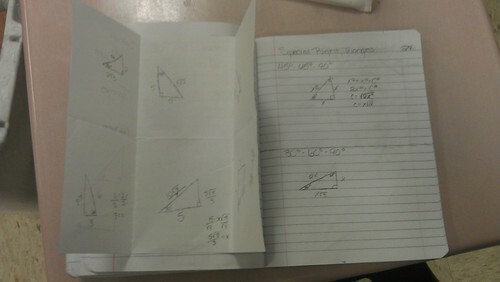 We do a reasonable number of foldables in my class. They can also be placed in the IN several ways. One is with the pocket. I like to ask kids write a reflection or conclusion on the bottom few lines, below the pocket. 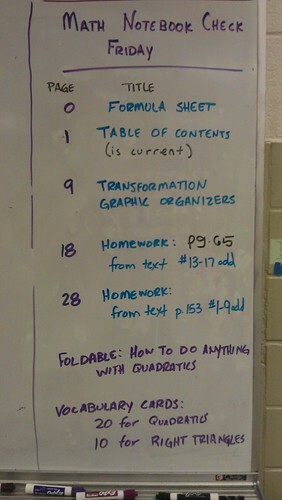 The pocket is also a great place to store lab reports, graphs, or other work that was done outside the notebook. I don’t think much of what I do in the classroom could be described as artsy-craftsy. Ok, probably nothing is artsy-craftsy. That purple pocket above is about as cutsey as I’ve ever done. 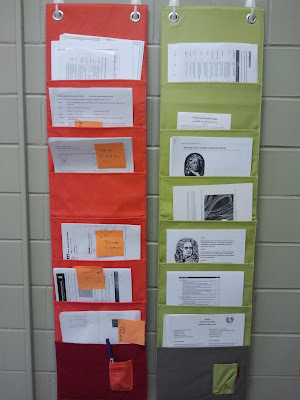 Aside from being crafty (and therefore appealing to that type of student), the IN helps everyone stay organized. We don’t lose assignments, forget to bring the vocabulary flash cards to class, or need a sheet of paper (that will inevitably get lost). In part 2, I’ll talk about how I manage grading work if the kids have all their papers with them all the time.